If you’re anything like thousands of people across Australia you probably have squashed farm ownership dreams. Look at the photos we have here of Tim and Tegan Hicks and their family, it’s so beautiful it makes you sick. But right now if things stay the way they are this photo of a happy family on their own farm will never be a reality. They don’t have the cash. They have the passion, vision, drive and skills, they just don’t have $5 million. What we’ve realised is that there are actually many ways you can resurrect your farm ownership dreams and we have listed these below. The first step on the pathway is to actually realise that you could own your farm. Without this hope, you won’t do the thinking or put in the effort needed to make it a reality. We’re telling you now that you can own your farm; it just might not be that you own 100% of the farm yourself. You could have a retiring farmer sponsor you onto their farm and set up a vendor finance deal with you – this is what happened all the time in the old days and we need to bring it back. You could own the farm with an investor or two. There are plenty of people buying farms, but they need your expertise and passion to make it profitable. Why not partner with them? There are organisations out there that can help you with all of this, as well which we will reveal below. Now that you are pumped to have your farm dreams back you need to ensure you are farm-ready. You’ll most likely be farming with other people so you need to impress them with a myriad of skills and passion. Write down your farm dream. Where is it? What are you farming? What methods will you use? How will you drag yourself out of bed at 4 am? This step clarifies what you’re fighting for. Make a note also of why you are passionate about owning your farm. What is it inside you that is burning? Describe it and talk it out whenever you meet with anyone – having a burning passion you can describe to others is powerful and you never know what opportunities might come out of it. What skills do you have and what skills do you need? Undertake an audit and if you don’t have the skills to match your dream, start learning. Jump online and find the courses available for that topic. Reach out to local farmers and ask them to be your mentor. Take a job as a farm manager and work hard to build your skills and reputation. At the same time, become the real-estate royalty of your district. You should know when farmers are looking to leave the land before they do. At the same time, everyone should know of your passion to be a farmer. This is so that when they are thinking of moving on you, will be front and centre in their mind as the best possible person to hand the farm over to. Be like an entrepreneur who is constantly hustling. Find as many different angles as you can to get yourself on your farm and pitch your vision and plan to anyone who will listen. Now that you are farm-ready and everyone knows it, we can get you on your farm. This doesn’t have to happen 5-10 years down the track. If you are hustling, you could find a retiring farmer who would back you onto their farm, or an investor who wants you because of your passion and tenacity. How do you find investors? You can try to Google them or else chat with organisations who do this for a living, such as Cultivate Farms www.cultivatefarms.com. The ball is now clearly in your court – your dream farm will reveal itself if you are looking and everyone knows you are. Author: Sam Marwood is the co-founder of Cultivate Farms. 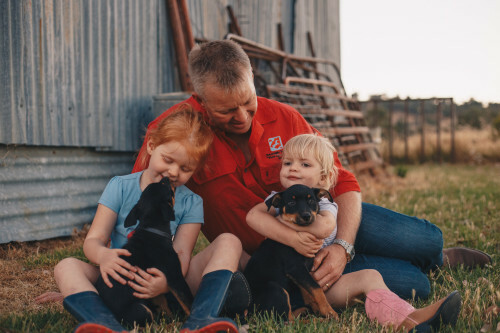 They are a social enterprise aiming to rejuvenate regional Australia by making it possible for young people to own and operate their own farm.